Standing at a towering 21,778 feet tall, Mount Kailash is a magnificent landscape considered sacred for Buddhists, Hindus, Bonpos and Jains. Get up close to the snowy mountain by taking a pilgrimage circuit – a walk around the sacred mountain to spot its natural beauty and the five lavish monasteries surrounding it. Located by the sacred Mount Kailash, head to Saga Dawa Festival to watch pilgrims replace the Tarboche flag and then join them for a multi-day trek around the mountain. If completed you’ll be granted with good luck, and the trek has spectacular views of the Buddhist monasteries and other cultural treasures. 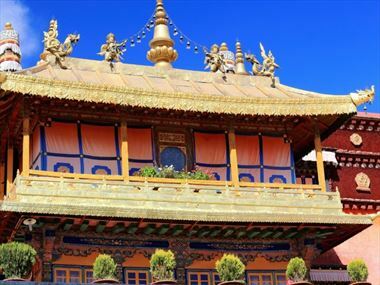 As the holiest temple in Tibet, Jokhang Temple is definitely a location to put on your itinerary. The grand temple is considered sacred due to its founding by King Songtsan Gampo and his two wives, who are recognized for bringing Buddhism to Tibet. His second wife, Princess Wencheng, brought a sacred image of Bhudda as a dowry and is still in the temple today, surrounded by architecture and treasures influenced by Tibet, Nepal, India and China. Tourists can only visit in the afternoon as pilgrim’s prostrate in the mornings, though it is worth the wait. There are plenty of exciting, bustling markets to enjoy, though Tianhai and Barkhor are the biggest and most popular. Tianhai is full of food, fashion and home appliance stalls, and although non-food stalls close at 12pm, the night market is an aromatic oasis of Tiebatan snacks until 5am. Barkhor is open all through the night and more well known to tourists, and you’ll be sure to find plenty of crafts and souvenirs here. Potala Palace consists of a beautiful collection of temples, palaces and offices areas, located on a tall mountain in northwest Lhasa and in a castle-like structure. Inside there are thousands of rooms containing numerous treasures, though visitors only get one hour to explore the grounds. No photos are allowed inside, and it is recommended that you take precautions for altitude sickness. There are three striking, sacred lakes to visit in Tibet. Yamdrok Tso is a natural reservoir filled with pure, clean water and surrounded by towering mountains. Namtso Lake is the largest in Tibet, and named after the Tibetan name for sky – Nam – as the still, clear waters reflect the landscape above. Lastly is Lake Manasarovar, towering at approximately 15,000ft above sea level. Pilgrims believe that bathing or drinking the water will cleanse them of their sins.